We produce fine pieces of Brass Fasteners Nut – Full Nut , Lock Nut, Dome nut, Screws – Pan Head, Cheese Head, Hex Bolt etc with the use of genuine raw materials. The brass fasteners produced by us are very much durable and also very much attractive. We offer a quality range of Metric Thread Rod. This Metric Thread Rod is basically a bar that is pre-threaded with metric thread pitch and can be cut to a length with a metal cutting hacksaw or power band saw. Further, this Metric Thread Rod nut moves with ease over clean cut ends and is developed as per the DIN standard 975. Our presented range of Metric Nuts delivers reliability to all commercial consumers. These metric nuts are available in different sizes and can be accessed from market as per the requirements. These nuts are widely applicable in mechanical industries. Our nuts do not get damaged due to high temperature and working continuously. - Alternative connection with K’ in K’ (plastic in plastic) design available. Venus Enterprise is ahead in offering an extensive variety of Metric Fasteners. Made utilizing high review stainless steel, these Fasteners are colossally acclaimed for their magnificent quality and high sturdiness. 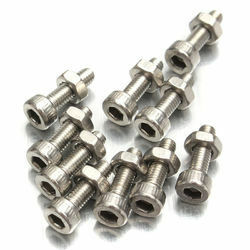 One can profit this Fastener in the assortment of outlines, shapes, and sizes according to their requests. SALIENT ENGG. 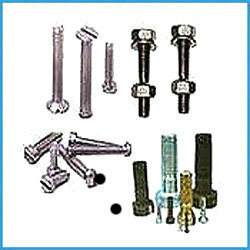 offers Brass fasteners, Brass Concrete fasteners, Brass Industrial fasteners , Brass Metric fasteners, Brass Construction fasteners, Brass Machine Screws, Brass Pan Head Screws, Brass Binder Head Screws, Brass Panel Nuts, Brass Lock Nuts, • Brass Hexagonal head screws, Brass Hexagonal Nuts, Specialty Brass fasteners. Threads :-: SO Metric, BSW, BA, BSF, UNC, UNF UNEF etc.